The major benchmark US indexes pared early losses to close higher on Wednesday, supported by the minutes from the Federal Reserve meeting indicating a gradual approach to interest rate increases. The tech-heavy Nasdaq led the way higher, rising 0.64%, while the S&P 500 gained 0.32% and the Dow advanced 0.21%. The small-to-mid cap Russell 2000 index ticked up 0.15%. 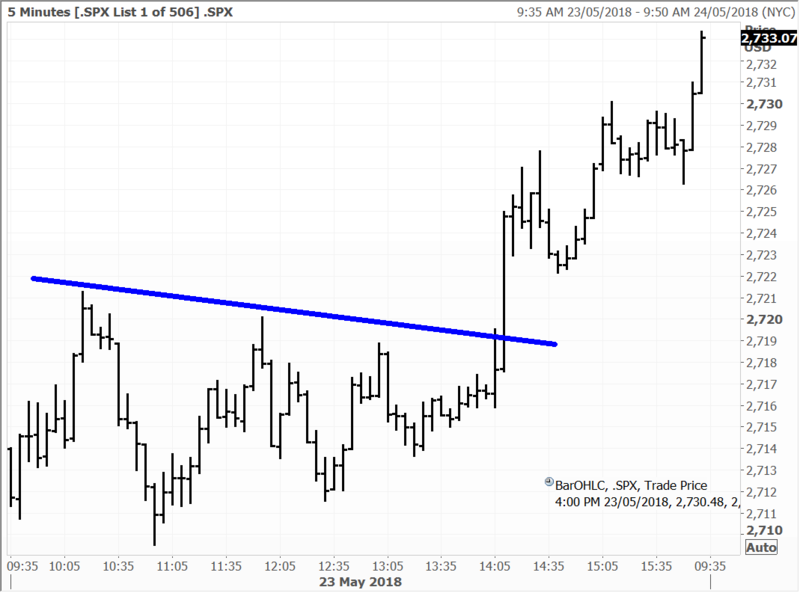 During the early stage of the session the S&P500 touched 2700, before buyers came in after the release of the FOMC minutes from the May 1 meeting, for the index to finish in positive territory. The bond market rallied as well with the yield on the 10-Year closing under 3% for the first time in over a week to finish at 2.99%, while the DXY gave up ground against the yen but still rallied 0.5% to 94. Commodities were generally firmer despite DXY strength with Brent oil lifting above $80 to make 4-year highs while notably, the VIX declined nearly 5% to settle in the 12 to 13 range for the first time since the February volatility spike. Comcast, the largest broadcasting and cable television company in the world by revenue, confirmed that it is preparing to top Walt Disney’s US$52 billion bid for 21st Century Fox. Walt Disney dipped 1.1% as Comcast confirmed it is in the final stages of making an all-cash bid for most of the assets of 21st Century Fox. This will likely see Disney respond in kind, as the Fox assets are a much better strategic fit within the House of Mouse and Disney has a strong balance sheet. Fox has refused to engage with Comcast, so any takeover will likely go hostile. The market is concerned that this could lead to a bidding war with Disney overpaying. It will be difficult however for Comcast to win, given that many major Fox shareholders are pro Disney and see the decline of cable TV as being a secular problem. Comcast will have to take on an enormous amount of leverage to fund a cash bid. Comcast has fallen nearly 30% this year. A takeover for Fox will be more about “desperation” in the face of a rapidly changing industry and the associated disruption from “Direct to Consumer” streaming. In Hong Kong, energy giant CNOOC slumped 6.1%, following other energy majors lower. Smartphone camera lens maker Sunny Optical bucked the trend, rising 1.3% as hopes persist that customer ZTE will be able to get back to business soon. In Australia the market was on the back foot again, with the ASX200 closing the session down 0.16% at 6,032. The energy sector weighed, with Santos falling 8.4% following confirmation that it had rejected the takeover approach from Harbour Energy. Overall downside action was contained by support for the diversified mining heavyweights Rio and BHP, along with a 1.5% lift in Telstra.